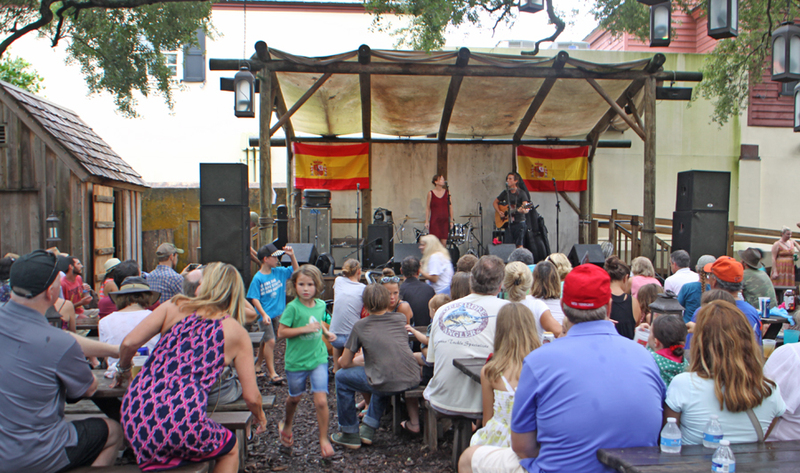 When it comes to throwing a big birthday bash, nobody tops Saint Augustine. Then, no other city in the country has been around for 450 years. For the big 450 Celebration they pulled out all the stops. When the planning started they asked all the usual questions. Bands? Let's get some of the best names. Stage? How about five? Weekend festival? No let's carry it over for four days from the Friday of Labor Day Weekend until Tuesday, September 8, the actual birthday. Not just the city but all the local businesses pulled together to make this the best and biggest birthday bash I have ever seen. Sightseeing trolleys provided free shuttles to move the expected 30,000 visitors. The news reported that there were not the predicted 30,000 people attending the Saturday main stage concert with Emmylou Harris and Rodney Crowell, Instead the numbers were about 50,000 filling A1A across the entire intersection and beyond and all the way back to the top of the Bridge of Lions with about 15,000 more spread around enjoying the other city entertainment. The city was packed with entertainers of all kinds. From head liner bands like Emmylou Harris and Rodney Crowell, Aaron Neville, Mavis Staples, Justin Townes Earle, JJ Grey & Mofro and others along with well liked locals like Sam Pacetti and his acoustical guitar and Billy Buchanan doing the best Ray Charles impersonation I have ever seen. 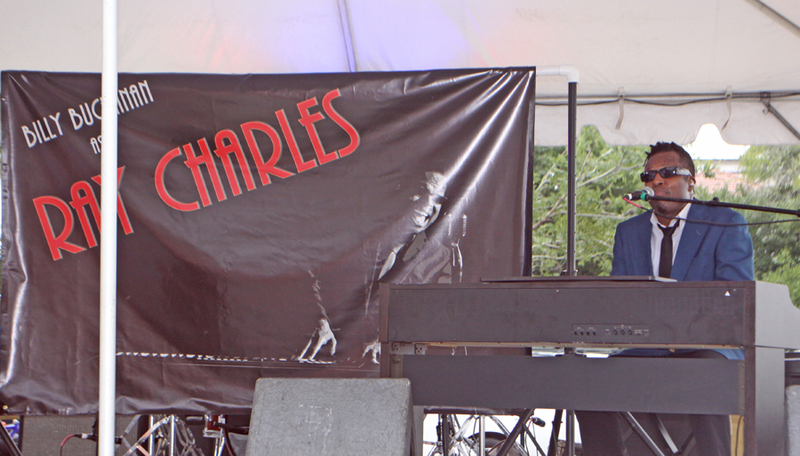 Incidentally, Ray Charles is part of the fabric of St. Augustine. He attended the School for the Deaf and Blind there as a child. The School for the Deaf and Blind also was part of the entertainment with their Dance Troup that preformed on Saturday. My first stop was the Visitors Center where a detailed cultural exhibit, Tapestry, portrays the interweaving of the three main cultures that began the fusion into the United States culture as we know it today. As Dana Ste. 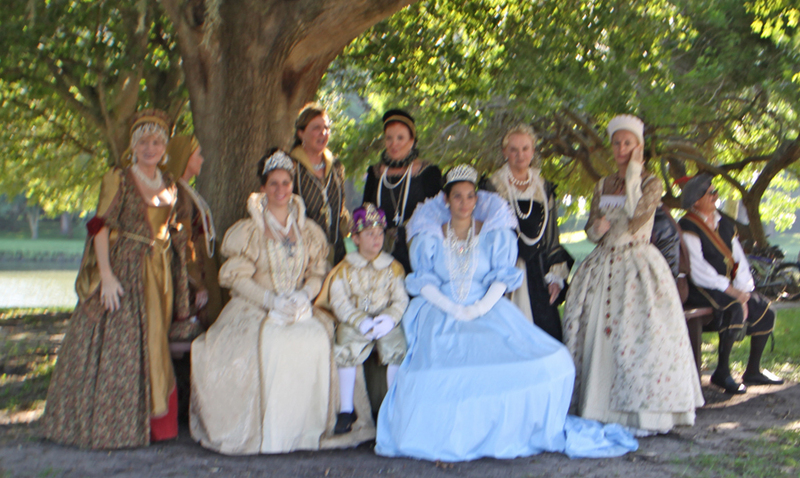 Claire Director of the St. Augustine 450th Commemoration, stated, "The cultural diversity is what we are celebrating. When Menendez landed in 1565, he had with him Spanish; Africans, both free and enslaved; and they merged with the Native Americans. That was the very genesis of American Culture. We celebrate that very rich spirit of multi-culturalism." Many other historical events also were front and center on one of the stages. 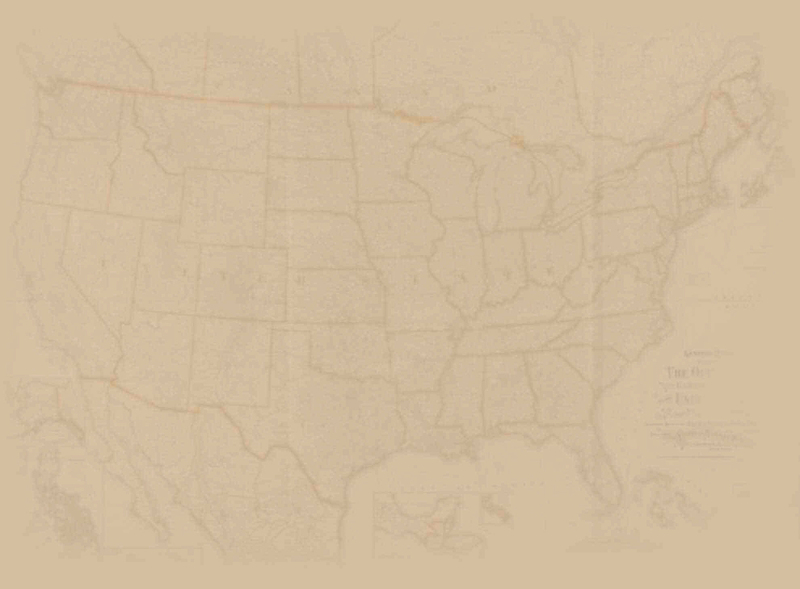 A little known segment of African American history was presented in Flight to Freedom which told the rich history of Fort Mose, the first African American colony of freed slaves.For more about St. Augustine's African American history, click here. 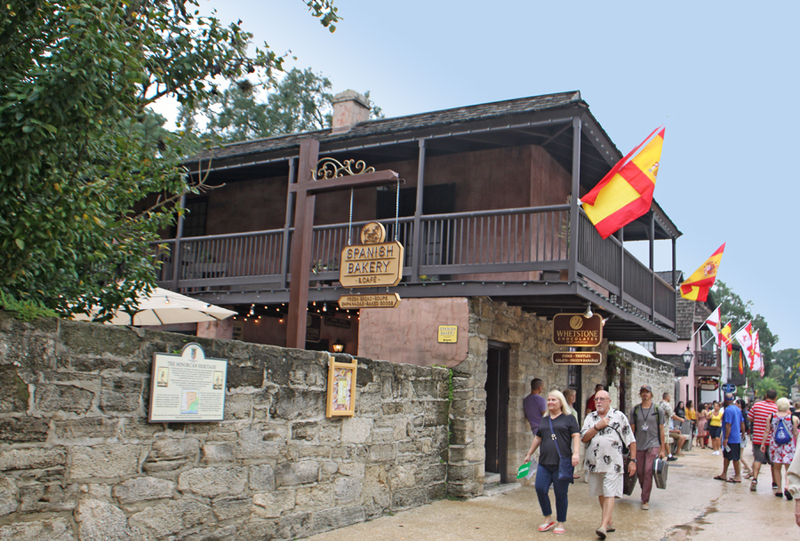 The Spanish Quarter which is a great attraction all year got a boost this time with some real Andalucían Cattle, Descendants of the cattle Menendez and later explorers brought from Spain to Florida. 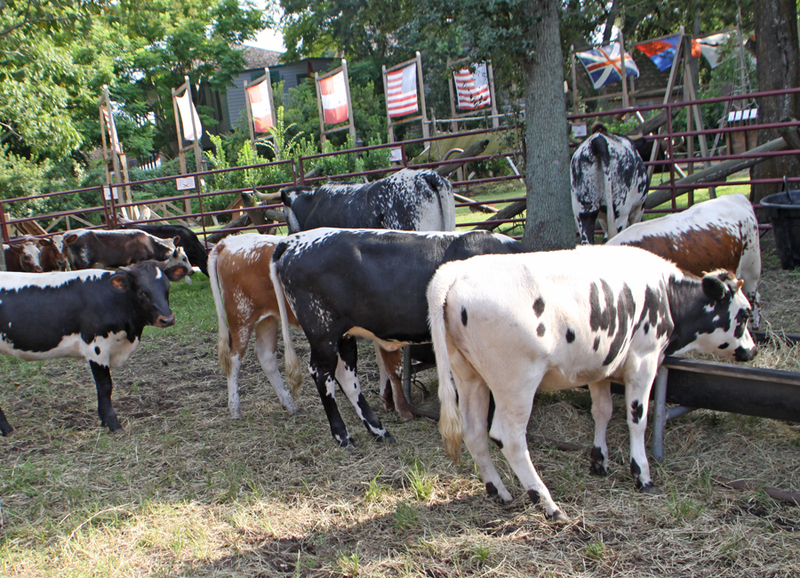 Today they are known as Cracker Cattle and were a big food source of the Confederates during the Civil War. 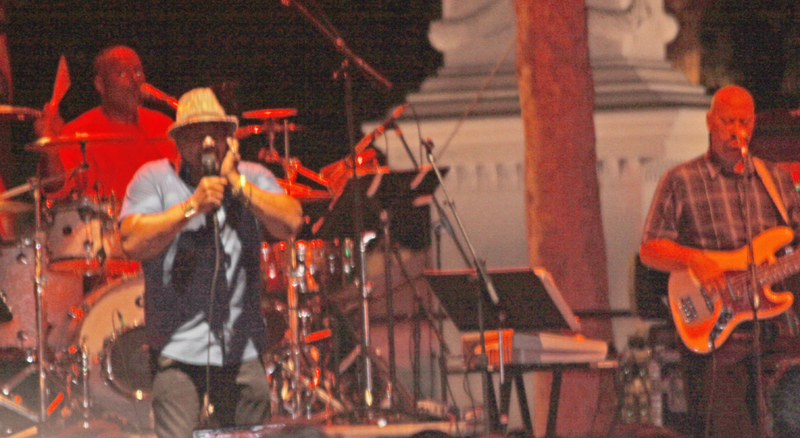 Three bands from Aviles Spain, St. Augustine's sister city, performed and EMMA (Emil Maestre Music Association) offered a Fiesta of Spanish dance at the Amphitheater. No way could I attend every event but here are some of the highlights of the entertainers that I did see. 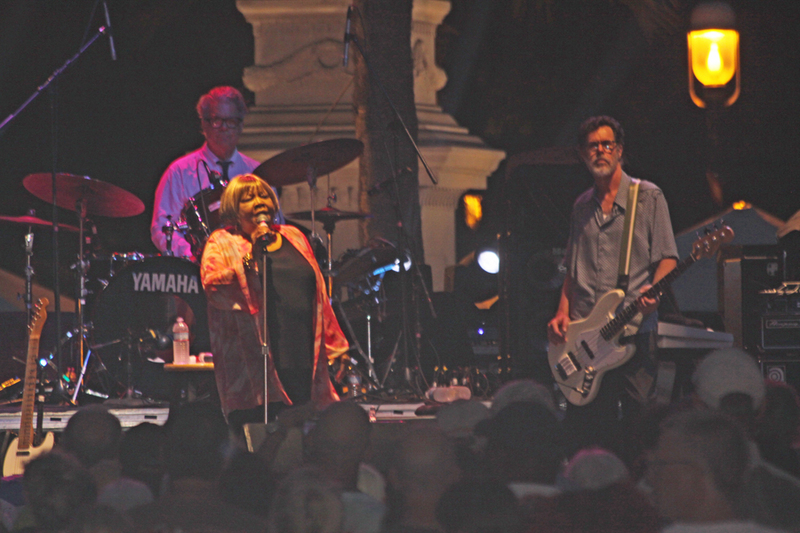 Mavis Staples kept the audience captivated as she quibbled with us. "St. Augustine, I love you. Why haven't I been here before? I'm going to move here." For me the high point was when she broke out with "Wade in the Water." It's an old song used by escaping slaves on the Underground Railroad as a secret message. I used it in my book, "Under a Black Flag" and it never fails to send chills down my backbone. Mavis Staples singing "Wade in the Water"
Aaron Neville made me homesick for New Orleans when he sang "Congo Square" and got most of us on our feet and bouncing around when he did his version of "Fever." At this point we're talking about 15,000 people dancing in the street. If Friday night was huge, Saturday night blew out all the stops with about 50,000 happy birthday attendees in front of that huge stage. I arrived while JJ Grey & Mofro were hammering out their unique blend of Southern rock, soul, rhythm and blues and their own Florida style. Naturally when they did "Lochloosa," that perennial favorite about the natural beauty of their home state, Florida, the crowd went wild. Gotta agree with them, "All we need is one more damn developer tearing her heart out. All we need is one more Mickey Mouse. Another golf course. Another country club. Another gated community." 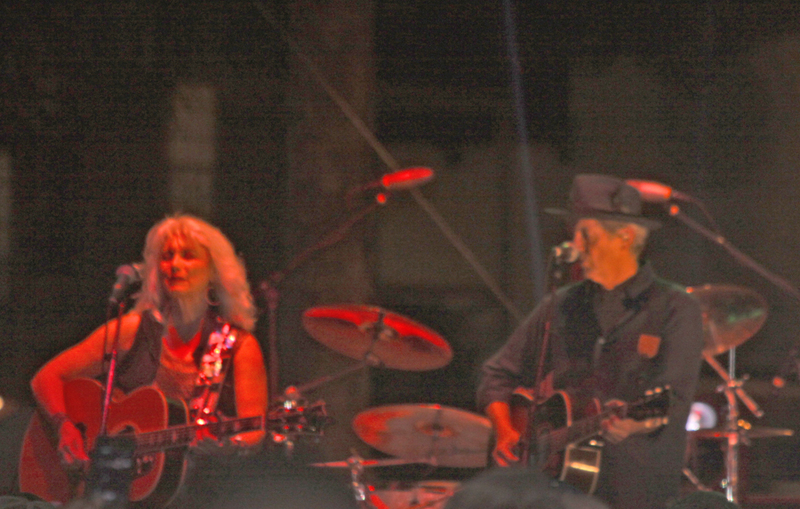 Emmylou Harris and Rodney Crowell brought their own blend of musical harmony to the stage next. Everyone welcomed the country/folk sound they have made famous in the many years they preformed together. Emmylou informed us the reason for the successful pairing was "We never got married." Whatever the reason, they are a perfect blending of voices. Some of my favorites for their show were "Bring it on Home to Memphis," "Leaving Louisiana in Broad Daylight" and Emmylou's soulful rendition of "Even Cowgirls get the Blues." What a show! The weekend wasn't over yet. The fireworks literally spelled out 450, Florida, and USA. I I made it home just before 2AM. Sunday and Monday saw the Cake Cutting and many more entertainers. Just imagine serving thousands of folks cake. Overall, 80 separate acts provided over 60 hours of entertainment that appealed to a diverse cultural crowd. Tuesday was the actual birthday. Hard to imagine a Spanish explorer after months onboard a ship with the nucleus of a small colony finally setting foot on land right here in St Augustine near what is now Mission of Nombre De Dios. HeHe set foot on land and kissed the cross offered him by Father Lopez. 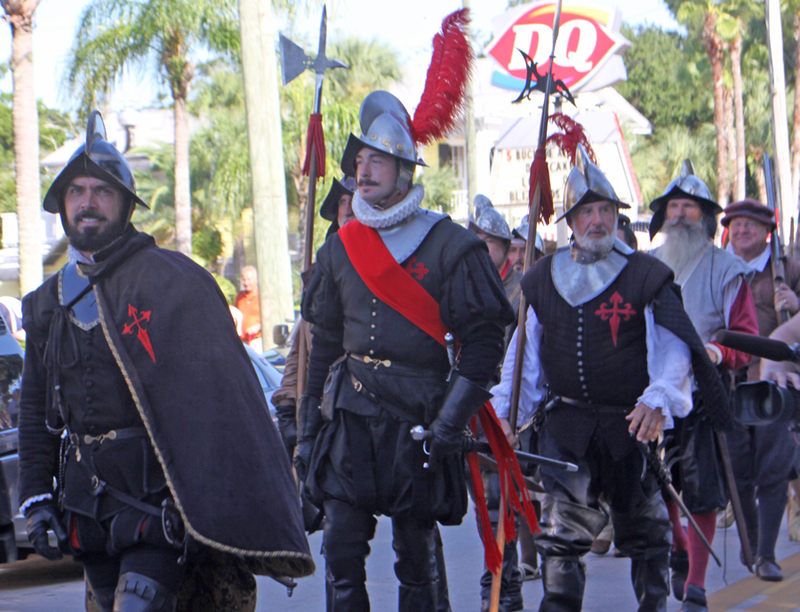 Menendez claimed the land for Spain and named his new colony St Augustine after which Father Lopez offered a thanksgiving mass. Menendez placed a small cross in the soft earth near the marsh. 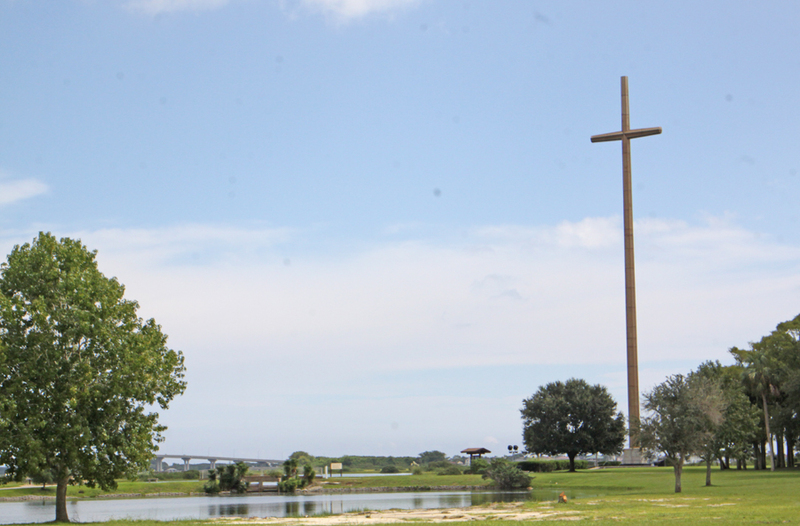 That cross was long ago replaced by a stainless steel one that rises two hundred and eight feet above the marshes of the Matanzas River. It was like taking a giant step back in time when Menendez once more got out of that small boat and proceed once again to establish his colony. After the ceremony at the Mission, Menendez and his procession composed of reenactors, city and church officials in horse drawn carriages, and any who wished to follow, proceeded to a the Cathedral downtown for a solemn mass celebrated by Archbishop Sean O'Malley of Boston sent as the Pope's emissary. A group of disgruntled protestors attempted to sabotage the festivities with chants of "No honor, No Pride, Menendez committed genocide" but hardly ruffled any feathers. A few who invaded private property were led away by police. It's history, folks. It happened and a city grew out of it so get over it. Even after the party's over there is much to do and see here. There are attractions here when you can trace the entire history of the city and have a lot of fun doing it. I do agree the Native Americans suffered at the hands of Europeans but in St. Augustine they are recognized and commemorated. Best ways to get around the city is to ride the tour trolleys. You get a great history commentary and save your feet a lot of wear and tear. A good place to start is at the Fountain of Youth. pan style="mso-spacerun: yes"> You can drink the rejuvenating water and you may become cooler but not younger. What you will get is entertainment and education. Kids as well as adults will be enthralled. The Fountain of Youth adjourns the place where Menendez landed and is the site of an ongoing archeological dig by Dr. Kathleen Deegan. There is a planetarium which explains how ancient sailors navigated unknown seas. SoSome of the exhibits you will encounter are the Spring House, site of the supposed magical water, replicas of the Timucuan Village of Seloy, the Mission of Nombre De Dios, a far cry from the present day church just a short distance away, Menendez Settlement complete with a Spanish Watchtower and several boats of the day, both Spanish and Native American. 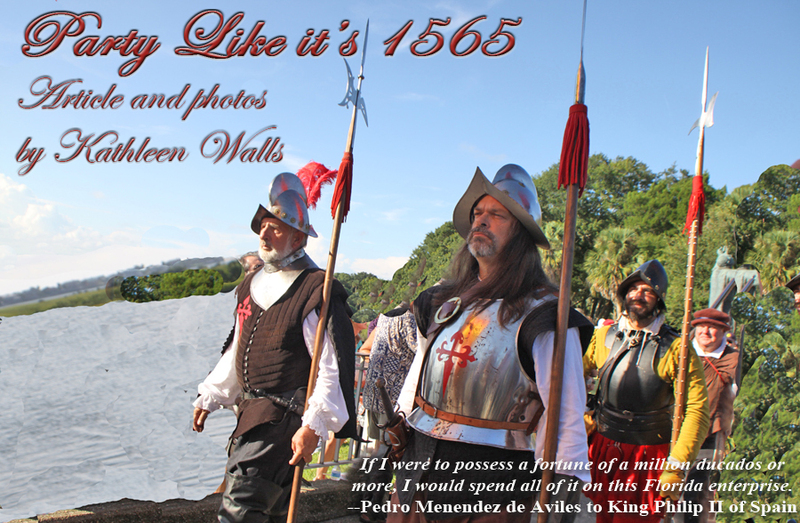 Children will be fascinated with the reenactors in period costume who demonstrate the way of life of the natives and early settlers. 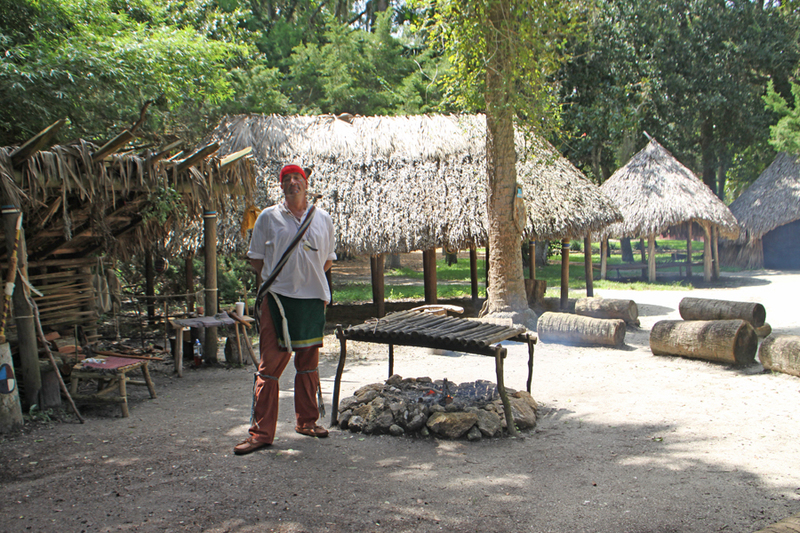 I spoke with a man portraying one of the Timucuans. He demonstrated use of the native weapons like bows and arrows and other parts of native life. 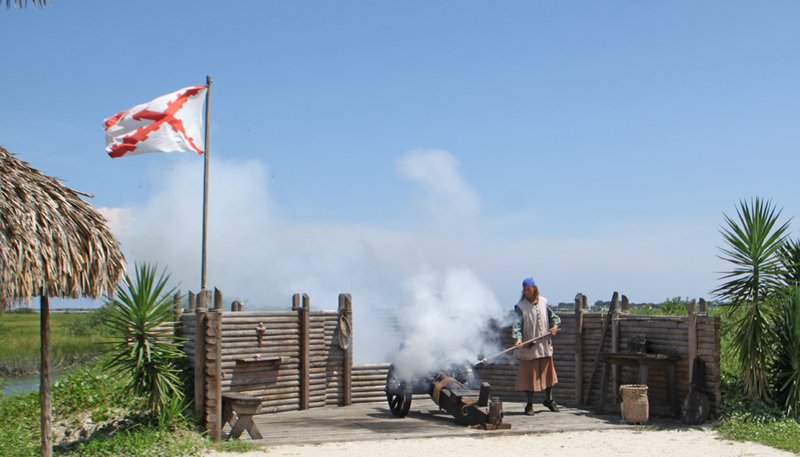 Since it was still early September and quite hot in St. Augustine, I noted the fire that was going in the center of his encampment. 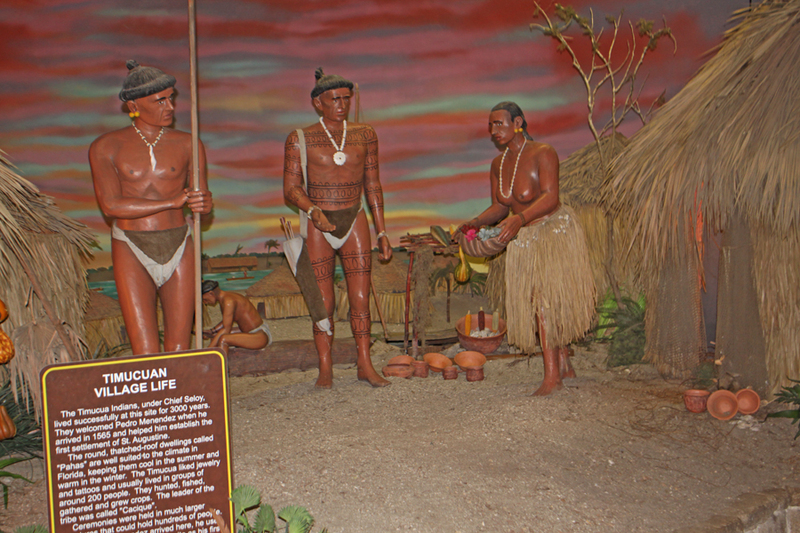 He explained that since it was difficult to start a fire using primitive methods, "Timucuans had a group of people responsible for keeping a fire lit at all times. Usually a tribal elder was the Fire Keeper but he would have some helpers. When he saw a young man who was interested he would teach him the skills and reasons for the ongoing fire." Firing the ancient Spanish weapons is another demonstration kids love. The canon which guards the bayfront is a two-man operation. One demonstrator explained to us how the gun was usually loaded. 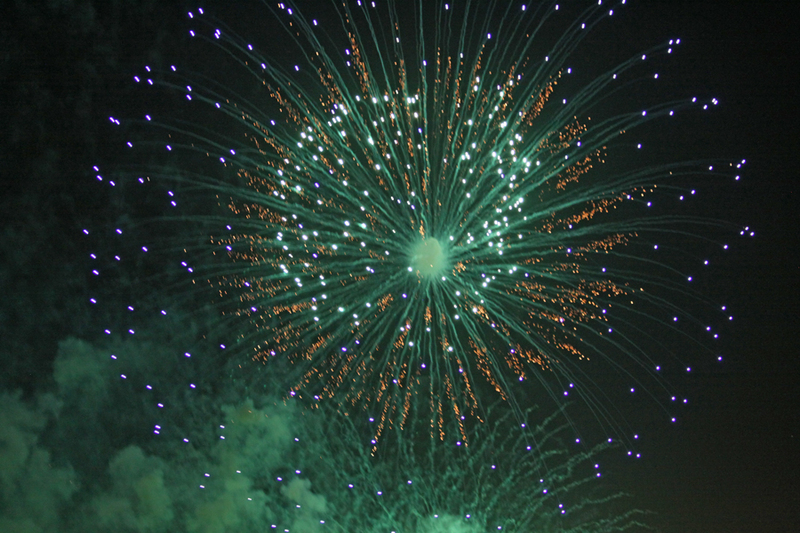 "At that time, soldiers would put three pounds of gunpowder to fire the round cannon ball. That's equivalent to three sticks of dynamite. We only use a few ounces." Before his partner touched off the cannon, he told us, "Best way to get a good picture is to get it framed then hold your finger over the shoot button. When it goes off, you'll flinch and shoot." He was right. That was a really loud boom. The reenactor who demonstrated the black powder loading rifle is so authentic. He demonstrated each step of the process and then fires off a round. Of course neither cannon nor rifle use a real bullet for safety reasons. The little boys especially love this demonstration. Another attraction little boys especially love is the Pirate and Treasure Museum. 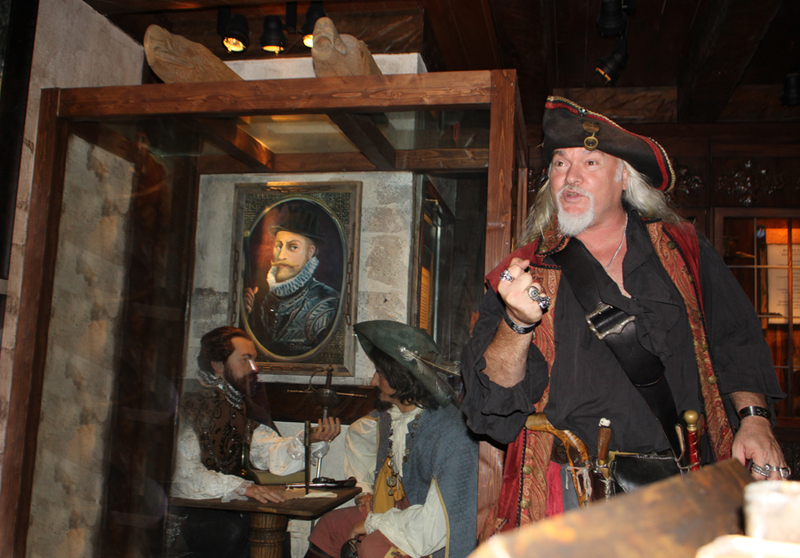 Adults, would-be-pirates, and history buffs love it too. 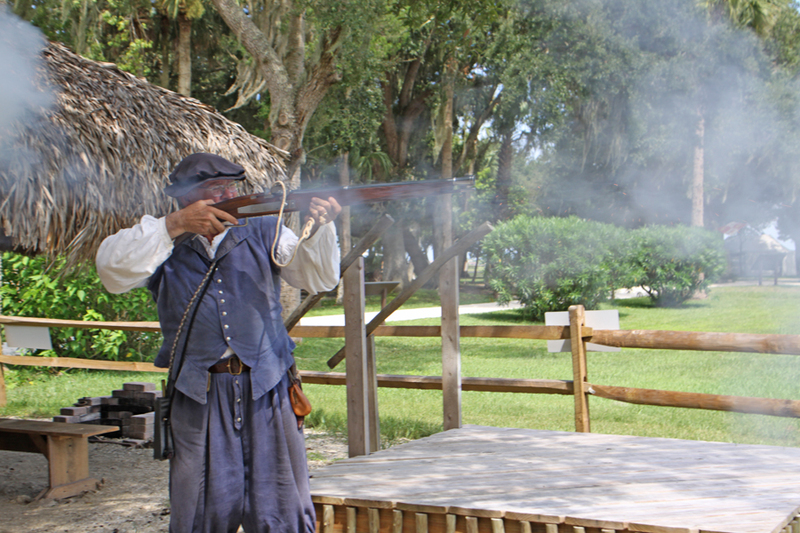 St. Augustine's early history was plagued with pirates. 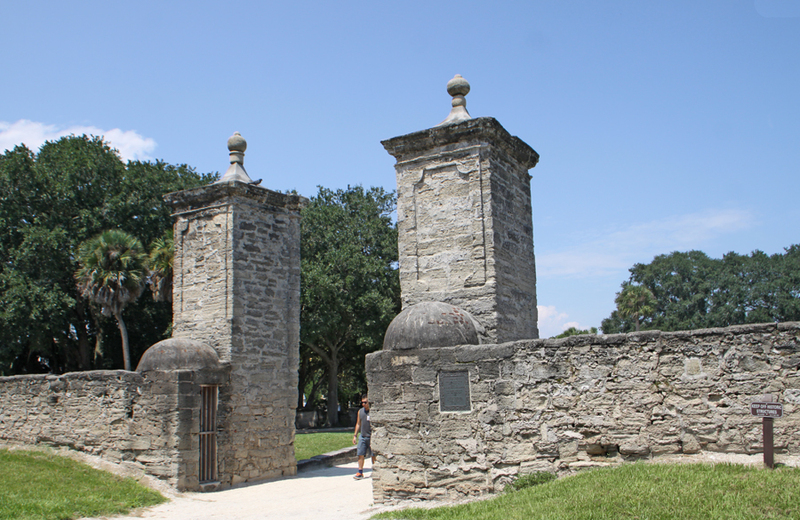 This museum will cover that bloody history and even show how it led to the building of St. Augustine's most iconic landmarks, Castillo San Marcos and the City Gates. Our tour was led by fearless Captain William Mayhem. 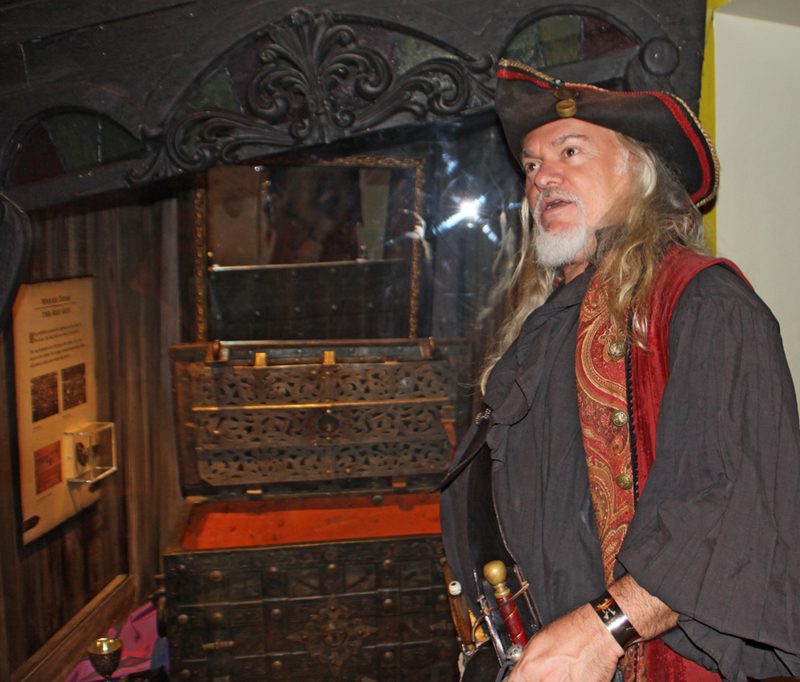 He did a fantastic job of leading us to the only pirate chest known to be in existence now and to a visit with Blackbeard's head. 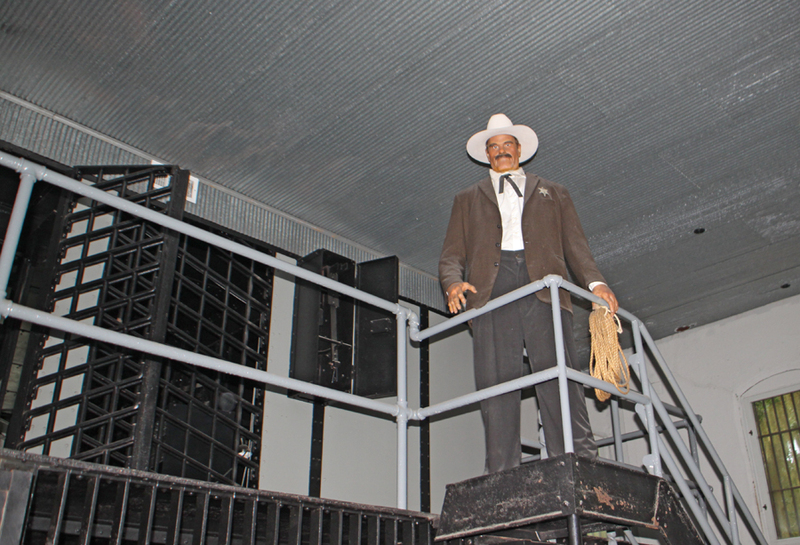 The museum is filled with great effects and true artifacts. It's the real McCoy not the Hollywood version. Wish I had had more time to spend there. Move forward in time to the era of Henry Morrison Flagler. 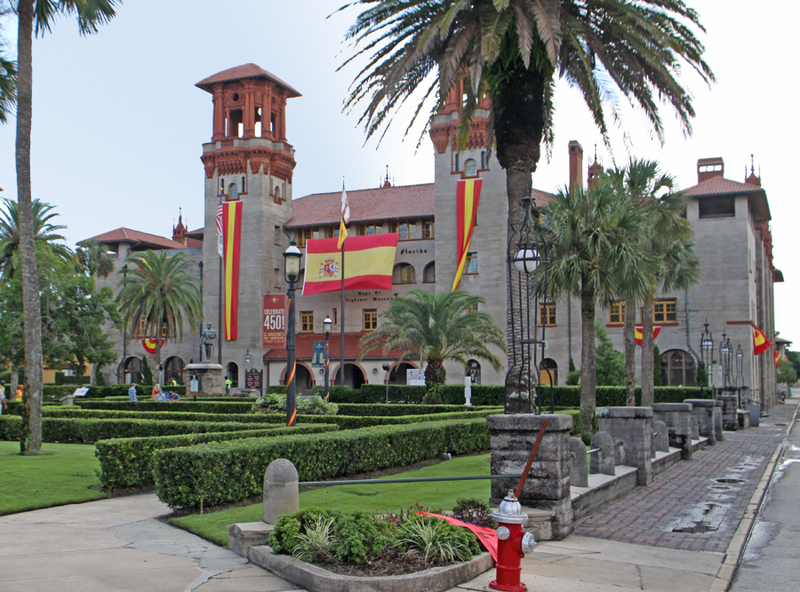 A tour of Flagler College, once Flagler's showcase hotel, the Ponce de Leon, showcases how a wealthy traveler lived in the late 19th century. 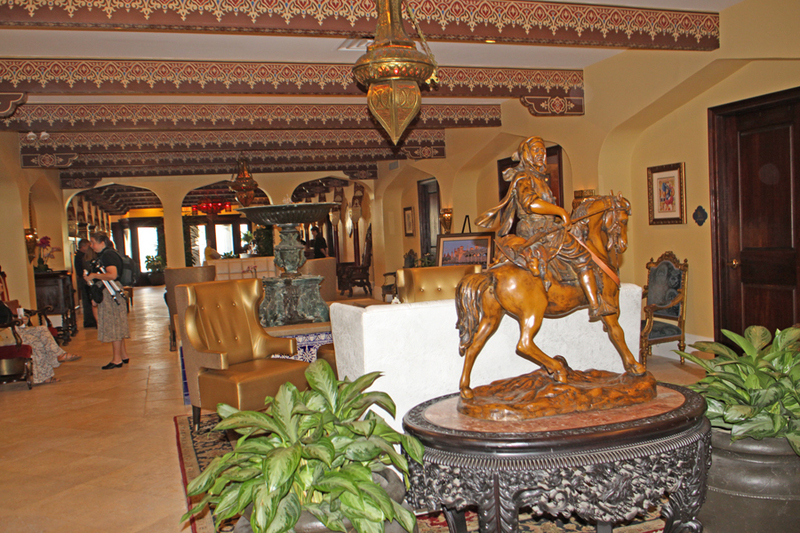 Just across the street, the Lightner Museum was once another Flagler hotel, Hotel Alcazar, built to provide nighttime activities such as a casino, indoor swimming pool, Turkish and Russian baths, a gymnasium and a grand ball room as well as other amenities the super rich would appreciate. Today, it's filled with fantastic treasures from glassware to a huge stuffed lion. Flanking the Lightner are two exquisite buildings created by a contemporary and sometimes partner of Flagler, Franklin Smith, The Casa Monica Hotel and Villa Zorayda. The Casa Monica has a varied history. Today it's a luxurious hotel. 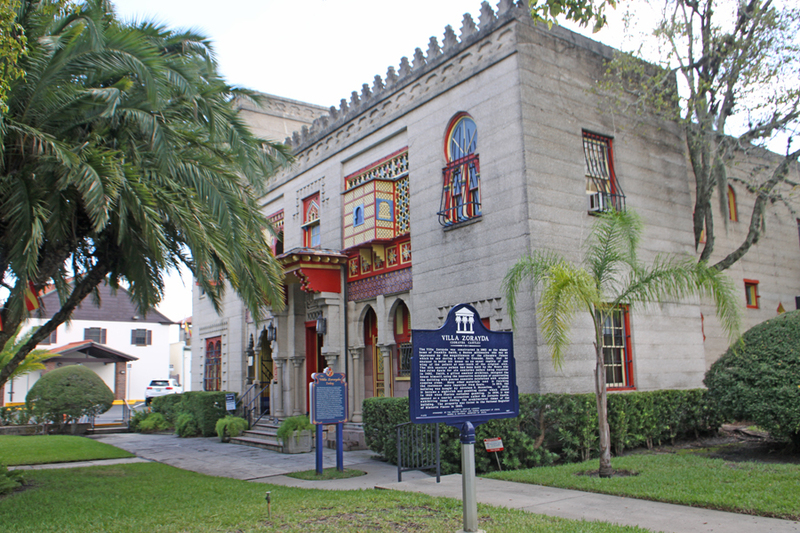 Prior to that, it was the city hall and city facilities for St. Augustine. Smith built it to compete with Flagler for his share of the northern money coming to winter in St. Augustine but it failed to produce the first year and Flagler bought it from Smith for pennies on the dollar. The failure might have something to do with the fact that much of the furnishings for the hotel were mysteriously lost while being shipped on a railroad owned by Flagler and never got to the hotel in time for the opening. The other architectural gem was Smith's winter home. He modeled it after the Alhambra in Spain. Inside and out it is filled with treasures. Since it only had one other owner after Smith, most of the treasures are original to the home. Imagine what a man with good taste could do with unlimited money and you get an idea of the scope of Villa Zorayda. There was one important thing Flagler failed to notice when he built his hotels; the city jail was right across the street. Now Flagler was a good PR man back before the term was coined. He knew it was not good publicity to have a jail right in the face of all those wealthy tourists. How he handled that bit of bad publicity was something I learned at my next stop, the Old Jail. 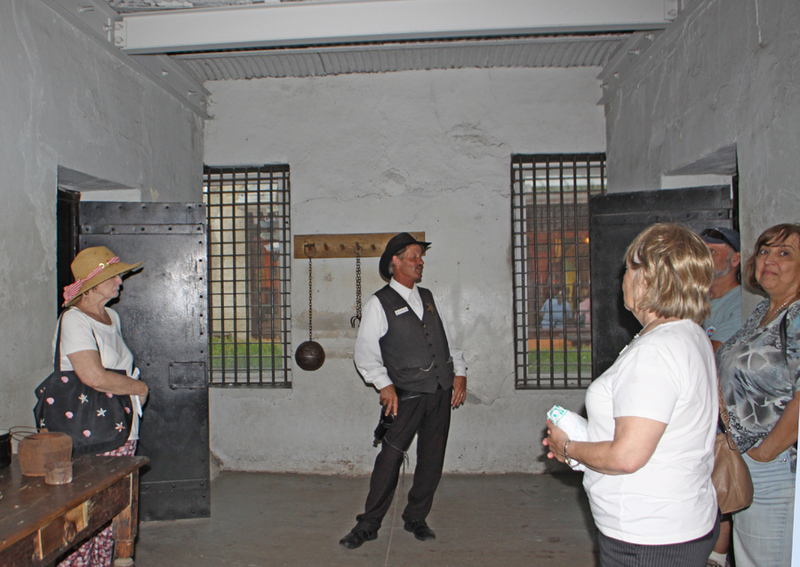 At the old Jail, I was "taken into custody" along with my fellow visitors by the very competent Deputy Clyde. He set us straight about why the jail was a mile out of town and painted pink with a cute Victorian porch. 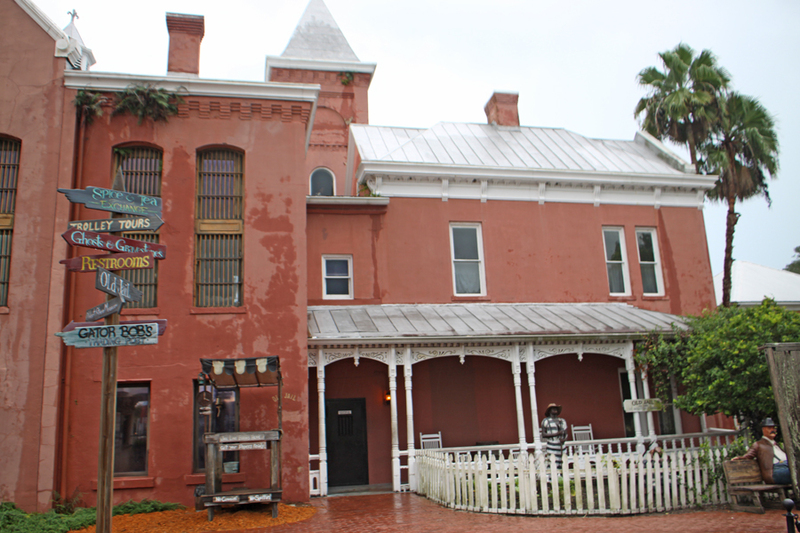 "This heah jail used to be down town across from Mr. Henry Flagler's hotel. He didn't want it there and went to the city council to ask them to move it. They explained to Mr. Flagler, 'We don't have the money to do that.'" Mr. Flagler promptly wrote them out a check for $10,000 and said ‘Will this help?' They replied ‘Sure, Mr. Flagler. Where do you want it and how do you want it to look.'" Deputy Clyde led us inside and showed us our cells. He explained that us women had it light as we only would work in the kitchen about 12 to 14 hours a day while the men would work on chain gangs for about 12 to 16 hours. I would never have relapsed had I had to serve a day in that jail. The Sheriff's home in the front section of the jail was a huge contrast to the cells. It was furnished in the height of style for 1891. The Old Jail is located just north of Ripley's Believe it or Not Museum, the first one ever opened. There is so much more to see and do in the Ancient City but I was partied out. I'll have to come back another day and do another story. I'm not sure if the words to that old Country song, "You can never have too much fun," are true. St. Augustine mayor, Nancy Shaver, speaking at the initial press conference said, "This is a seminal event for us… Our 450 celebration is like throwing a stone in a pond and the ripples from this will go on for a long time. Cover this well and tell the story over and over because we need to knock the chip off our shoulder about Jamestown." The mayor is right. Jamestown, as well as other larger and more prosperous cities have cause to be jealous of St. Augustine. Not only does it hold the honor of being the first continually occupied European colony in the country, it also throws the best party.